Slipring type toothed clutches can transmit higher torque compare to other multi disc clutches of same size. Toothed electro magnetic clutches provide positive connection between two shafts by remote electric control. Toothed clutches can only be engaged either a rest or at a small speed difference between the two parts. 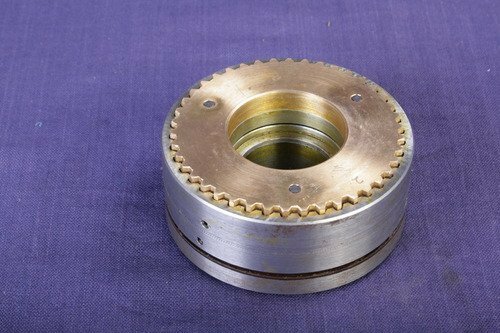 Toothed clutches can only be operated when the two shafts or pieces of machinery to be coupled are stationery running at the same speed or at very slightly different speeds, but it may be disengaged at any speed under load. When compared with other types, toothed clutches transmit more torque with less physical dimensions. Toothed clutches can be operated in wet or dry condition and don't require any adjustment during life time. It consists of a magnet body and toothed ring and slipring mounted on the outside and armature plate. Springs on guide pins ensure t hat, the toothed rings are kept apart when the clutch is disengaged. Normally there are two parts, one is keyed to driving shaft and the other one is keyed to driven shaft. The adopter plate can be supplied for mounting the armature plate. When the coil is energized it produces magnetic flux and the clutch is engaged and transmits the torque. All clutches operate from 24V DC supply. 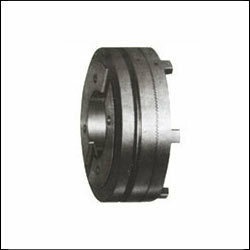 Generally slipring type toothed clutches can be operated in wet or dry condition although wet operation is preferable. These clutches are used for heavy torque transmission in rolling mils, cement factory, steel industries, machine tools industries for synchronizing conveyor, generator, wire winders, heavy duty machines, hoist, cranes traverse and trolley drives, winches etc. There are three designs available in toothed clutches. Toothed clutches without slipring with ball beraing or withour ball bearing. Toothed clutches where springs engaged electrically released.